Bare patches in an otherwise full, healthy lawn may be the result of pet urine, heavy foot traffic, infestations by grubs or other pests, or a variety of other causes. There are several ways to effectively patch these areas, but you also need to consider the causes and correct them if you can. For example, if a bare patch occurs because natural foot traffic continually pounds one area of your lawn, no fix will be permanent unless you also solve the traffic flow issue. And if the bald spots are caused by a lawn grub problem, new bare patches will crop up as soon as you repair the old ones, unless you address the grubs. There are two easy step-by-step methods for restoring bald patches in your lawn: reseeding, and patching with sod. This easy procedure is inexpensive and requires only about 20 minutes of your time, plus some upkeep until the first or second mowing. Its drawback is that it will take several weeks for the patch to fully blend into the rest of your lawn. Rake and remove any debris or dead grass from the area, using a garden rake. Now is the time to examine the area for grub damage. If the damaged patch of lawn lifts up easily, like a rug being lifted, you may have a grub problem that needs correcting. Break up the soil with a hard-toothed lawn rake or a garden cultivator. If the soil seems very compacted, you might consider aerating it with a manual core aeration tool—a simple device that drills small aeration holes by stepping on it as you would a shovel. Manual aeration tools are available at garden centers and are a good tool for every homeowner to have. Add about 2 inches of compost or loamy soil and mix it into the existing soil with the rake. Turn the rake upside down and use the top edge to even out the surface, spreading some of the mix into the adjacent areas. Sprinkle grass seed evenly across the area, thick enough to cover the surface but not so thick that the seeds pile up on top of each other. Use the appropriate seed for your region and micro-climate (sun or shade). Perennial ryegrass should be a part of the blend because it will quickly germinate. Do not fertilize yet. While this step was once recommended, most experts now suggest that starter fertilizers are not useful until after the grasses are well established. Lightly rake in the seed to a depth of about 1/2 inch. Be careful not to rake away the seed. Use a roller or your feet to slightly compact the soil and bond the seeds to the soil. Until the seeds germinate, you may need to protect the area from birds. Using reflective tape or pinwheels mounted on short stakes may discourage birds from eating your seeds. Lightly water the area. Keep the seedlings moist throughout the day until they've reached a height of 2 to 3 inches. It may take as long as 10 days for the seeds to sprout and another two weeks to reach the desired height. If hot weather is a problem, you can use a sheet of burlap to cover the patch. this will provide shade and keep the tiny seedling from drying out. Allow the grass to grow slightly longer than the rest of your lawn until the color of the patched area begins to blend in with the rest of your lawn. This may mean mowing around it for two or three mowing cycles. Some seed manufacturers suggest waiting a full seven weeks before mowing the new grass. A quicker method is to patch the bare spot by cutting a patch from a roll of grass sod. This is a good method if you have several bare patches to treat. A roll of sod costs only a few dollars, and you can cut many patches from a single roll. 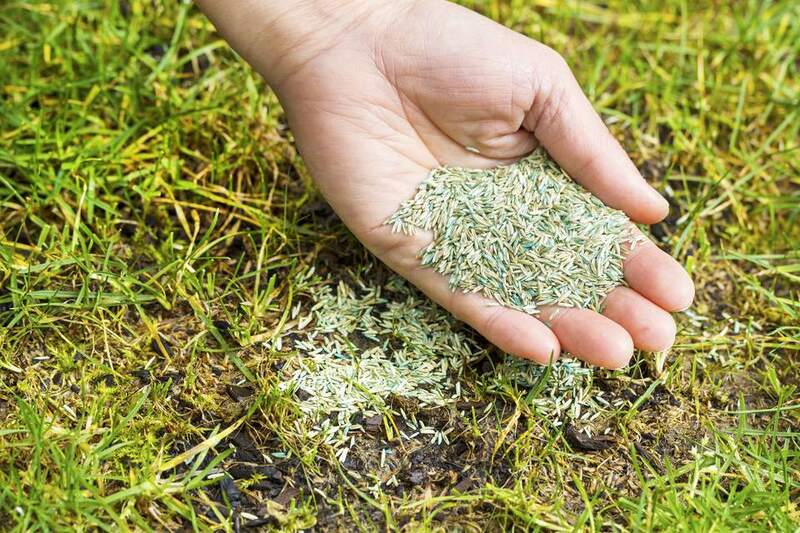 Use a sharp shovel or garden knife to cut a patch of sod grass that is slightly bigger than the bare patch in your lawn. The patch should extend 2 inches or so beyond the edges of the bare spot into the healthy grass area. Place the patch over the bare spot. Use a sharp shovel to "trace" around the sod patch into the healthy lawn around the bare spot. Remove the sod patch, then remove the dead grass and the ring of healthy grass around the bare patch, using a hand cultivator. Remove a layer of soil below the grass: Your goal is to dig down slightly so that the sod patch will sit down at the same level as the rest of your lawn. Loosen up the soil in your patch area, using a shovel, garden rake, or cultivator. You want the soil nice and loose so that the roots in your sod patch can quickly grow down into the soil. Place the sod patch into the excavated area, and compress it down into the ground by walking on it repeatedly. Water immediately, and repeat watering two or three times a day for several days, until the sod patch is bonded and is beginning to grow actively. Within no more than a week or two, your sod patch should be seamless and indistinguishable from the rest of your lawn. Do not be surprised if it is a slightly different color at first; this will disappear soon.